Giardino is an apartment in a former church, built in the year 1000 with an entrance on the side. At the front of church is a large space that is used for special activities such as a yoga course. The former church consists of two apartments. It is a unique holiday home for families and friends who want to spend their holiday together but also value their privacy. The interior of the house is rustic, simple and cozy. The former church is in a unique and magical place between the cypress, lavender, olive trees and rosemary. It is a blend of fragrances that give you the real Tuscany holiday feeling. The colors of the Maremma sunsets are unforgettable. The scenery is breathtaking and deer do you regularly. The location is very quiet, ideal for relaxing. 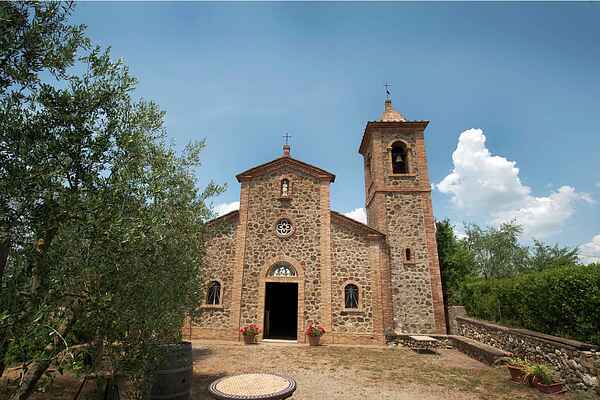 The church is located in a strategic position for visiting the Maremma region, Montalcino, Siena, Pienza, Punta Ala. The friendly owner offers various activities including a cooking workshop on application and in the summer there is a dinner for all the guests together. In this former church you will experience a special vacation you will not soon forget!